Enjoy the spa experience of a therapeutic ultrasonic skin treatment in the comfort of your own home. The Rejuvena Ultrasonic uses healing massage and negative ion therapy to smooth the appearance of fine lines and target deep wrinkles. As you use the Rejuvena over a period of time, you can expect to notice a change to your skin tone as it becomes firmer and discolorations become less noticeable. Incorporate the Rejuvena Ultrasonic into your daily skincare routine. Deeply and gently cleanse your skin while you treat it to a deep therapeutic massage. 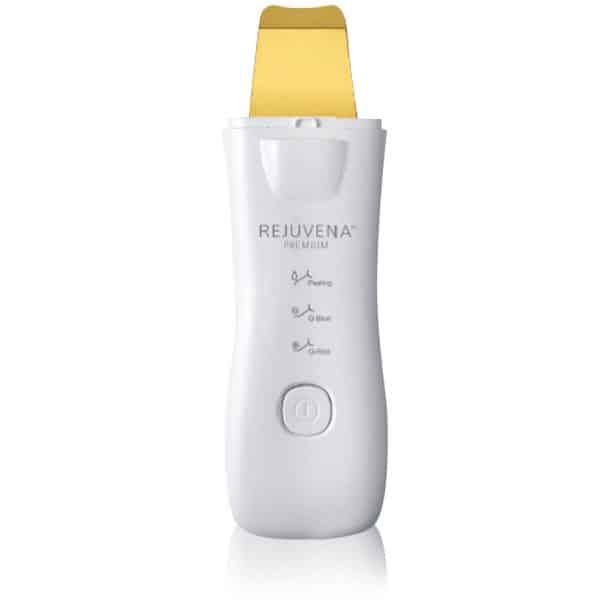 The Rejuvena is safe to use daily – in fact, for best results and more youthful looking skin, we recommend daily use. Look younger by smoothing your skin and revitalizing your appearance with the Rejuvena Premium. The Rejuvena Premium is a three in one ultrasonic rejuvenater, ionic skin treatment system with blue and red light therapy. Remarkable results in 3 steps – gentle water peeling, ion treatment, and red and blue light therapy. When our skin is unable to cleanse itself and exfoliate naturally, pores become clogged, dirty old cells build up and and our once beautiful skin appearance becomes aged and dull. Richway & Fuji Bio has developed the Rejuvena Premium to address the unique requirements of aging skin. The Rejuvena Premium will gently and naturally restore your youthful and glowing skin. The water peeling mode is painless and gentle on your skin. It uses 20,000 vibrations per second to deeply cleanse and remove contaminants and old cells, revealing your natural skin. The Ion Treatment mode uses a current to increase the efficacy of skin nourishing products by deeply pushing nutrition into your skin. Ions penetrate nutrients deep into the skin and microcurrent treatment on the surface of the skin gives you a luminous glow. When using Ion Treatment mode, the Red Light Heat Lamp aids in the absorption of nutrients into the skin. Blue (470 nm) and Red (624 nm) Light treatment refreshes and revitalizes exhausted skin. BLUE: Reduce visible signs of aging and sagging skin. RED: Skin rejuvenation treatment. Our advanced Pure C Serum is a unique, oil-free patented Vitamin C formulation that contains powerful antioxidants designed to help reduce visible signs of aging and sagging skin. Apply before using the Rejuvena in Ion Treatment mode. Use the Ion Treatment mode every day or even twice a day. 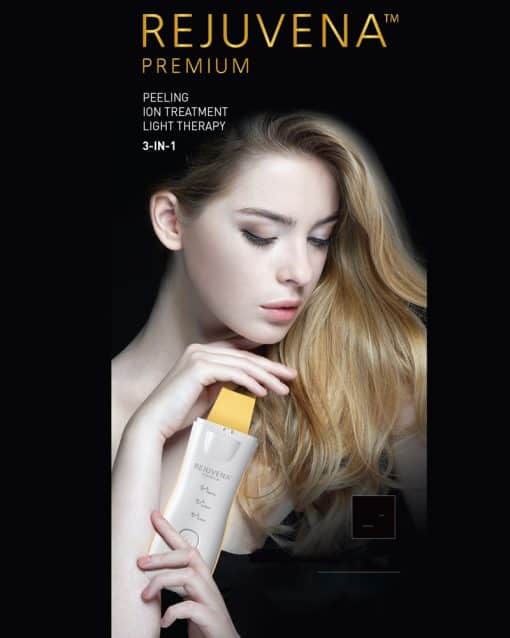 Ion Treatment Mode: Use it with cosmetics to increase absorption of active ingredients. The red light heat lamp on the other side helps cosmetics to absorb better during Ion Treatment mode. Hold the button for 3 seconds. It will make a beeping sound and turn off. ► Mate rial: ABS / PC / etc. 2. Insert the connector of the charger into the Rejuvena 7000. 3. Plug the charger into an electrical socket. When the unit is connected properly, the indicator will light, and charging will begin. 1. Press Power button once to turn it on (Standby Mode). 2. Press once more, to turn on “Soft Peeling Mode”. 3. Press once more, to turn on “Ion Treatment Mode with Red Light Heat Lamp”. 4. Press and hold for 3 seconds to turn off. 1. You can charge the unit by plugging in the USB cable (included) or a charging cable for a Smartphone (MHL cable). 2. Power/Charging Lamp will flash on & off while charging. 3. Once fully charged, the lamp will stop flashing. 4. Recommended to use over 5V/1A capacity items when using an adapter. Use a soft, clean cloth or tissue paper to wipe the blade after each use. Alcohol can be used to disinfect the blade. Avoid letting water get inside of the machine during use and be sure to remove any water after use. Do not place it in water or use soap to clean. Avoid hot or moist places and store it in a cool, dry place. Keep it away from water in the bathroom or sauna. When used for more than 5 minutes, the unit will turn off automatically. This is a safety feature. If your skin becomes irritated, stop using immediately and consult your therapist. Do not use on irritated skin, such as abscesses or eczema. When finished massaging, clean the blade with a soft, clean cloth or tissue paper. 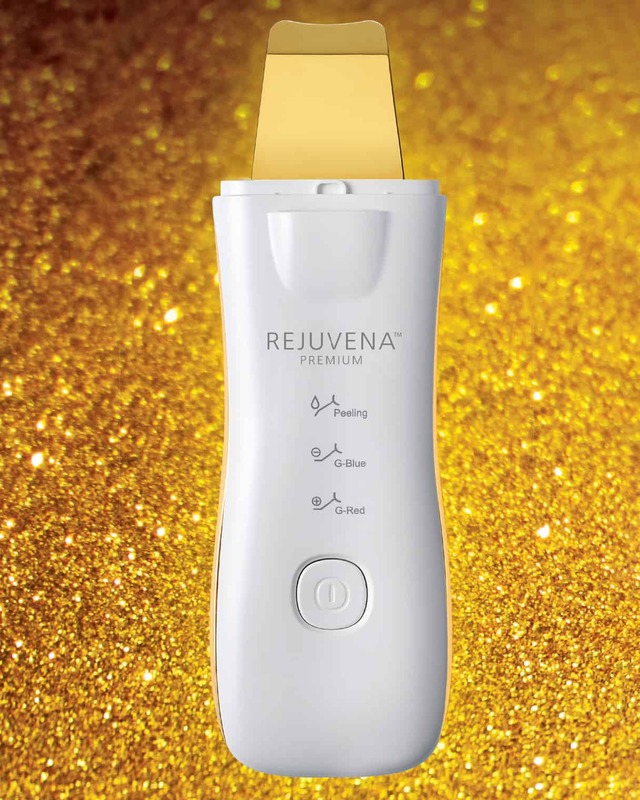 The Rejuvena Premium is a high-tech precision instrument. Do not store it where the temperature or humidity is high. Prevent physical shock such as dropping. Do not leave in your car on a hot day. If you have not used the Rejuvena Premium for an extended period of time, the unit should be charged. It can be used for a total of approximately 2 hours before it needs to be charged again. Keep the charger clean by wiping it with a clean cloth or tissue paper. Only use an adapter that is compatible with the Rejuvena Premium, or the unit can be damaged. If you encounter any problems while using the RejuvenaPremium, contact Richway & Fuji Bio at (808) 589-2800 or 855-338-6410 (toll-free), and ask for the Service Department. Damage caused by mishandling or carelessness will not be covered by the warranty. The warranty will not be honored if you disassemble the instrument.